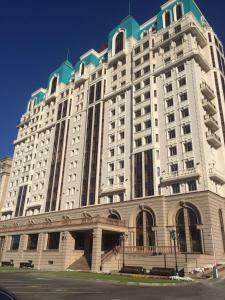 G Empire Hotel is perfectly located for both business and leisure guests in Astana. The property features a wide range of facilities to make your stay a pleasant experience. 24-hour room service, free Wi-Fi in all rooms, 24-hour front desk, express check-in/check-out, luggage storage are on the list of things guests can enjoy. Comfortable guestrooms ensure a good night's sleep with some rooms featuring facilities such as television LCD/plasma screen, separate living room, internet access â�� wireless, internet access â�� wireless (complimentary), whirlpool bathtub. Take a break from a long day and make use of fitness center, sauna, table tennis, steamroom. G Empire Hotel combines warm hospitality with a lovely ambiance to make your stay in Astana unforgettable.